These days mobile malware has become much harder to detect than two year’s ago and everyone is noticing. The latest is Craig Young, from nCircle’s VERT team (read his blog DEFCON SNEAK PEEK: HOW RISKY IS GOOGLE APPS FOR YOUR BUSINESS and, if you missed it, check out his talk at DEFCON 21, Android WebLogin: Google’s Skeleton Key). The long and short of the story is that Google not only accepted the app in the Android App Store, but it took them a MONTH to block it. The interesting thing is that this simple application (you can find the binary here) is as simple as my BSides Las Vegas demo APK file. The program has just one activity, which is not recognized as malicious by any of the APK analyzers that Craig tried. 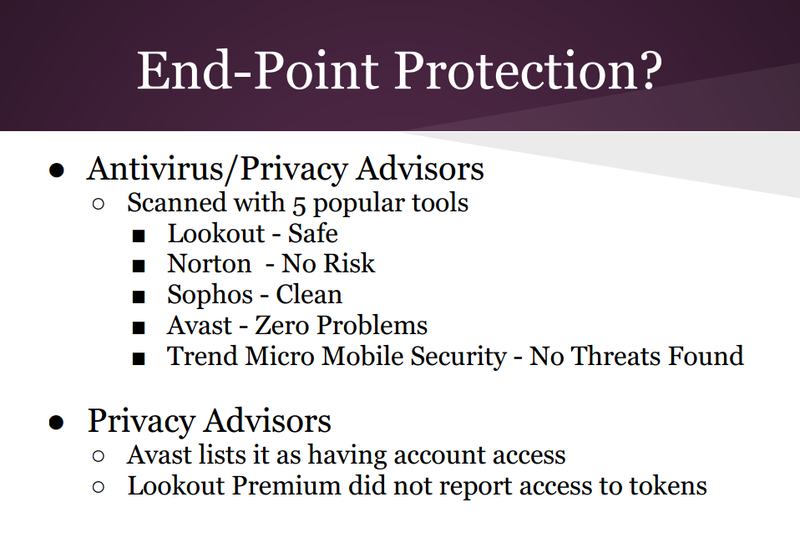 Before he had written to me and request to join our BETA program, he already tried Lookout, AVG, Trend, Sophos, Avast, Anubis, which are the most popular Antivirus or analysis platforms. This morning, I received another email from him because he really wanted to know the detection result for Trustlook’s platform before he heading to another security conference. Here is the detection result from Craig’s DEFCON presentation. To be honest, when I load his application on our platform it crashed. I reversed the app’s binary and find it needs google apps because it will read your device account and then try to authenticate to finance.google.com. Based on Google’s policy, we can not load those apps in our virtualized cloud-sandbox environment. I have to hack a real phone and load Trustlook’s ROM and then load Google Apps to make it legal. So, that’s what I did. Here is the Risk summary. For for the list of risky behaviors, you can see that the application steals user account information, reads the device browser’s private data, manipulates browser setting. (WTF, a spell error, s/provoider/provider/? Our dev team just fixed it). 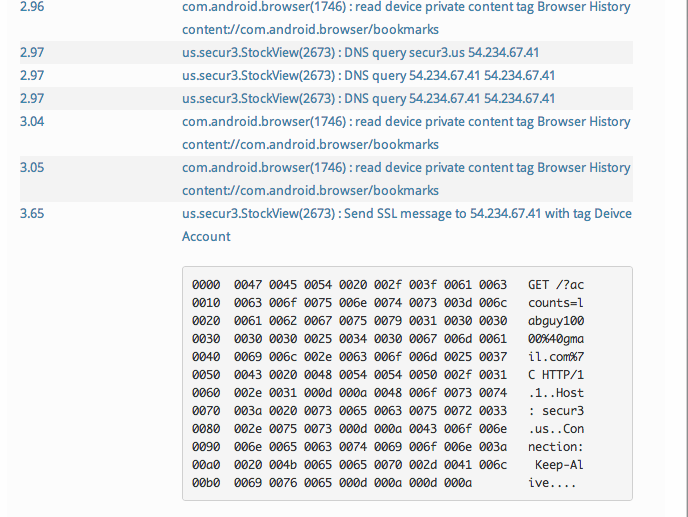 Here is one of the most suspicious behavior that looks strange to me. Craig’s application steals the user’s account information using SSL and send to external server. If only any users who installed this (or Google before they approved it) had been using Trustlook, they’d have detected Craig’s malicious application instantly. Note: The detection result we had is not perfect as we are still in a private BETA and there are a lot of features need to be implemented, many bugs need to be fixed. If you find we have anything wrong, please feel free to write us a email (info@trustlook.com) or write on our facebook wall.